Beyond taxonomy and body size? The general theme is being based around the ongoing European Science Foundation SIZEMIC Research Network, which has been running for several years. 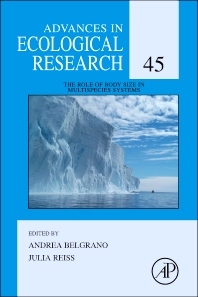 The network has focused on the role of body size in ecosystems and embraces a wide remit that spans all ecosystem types and a range of disciplines, from theoretical to applied ecology. Andre Belgrano is currently at the Swedish University of Agricultural Sciences, Department of Aquatic Resources, Institute of Marine Research, Lysekil, and at the Swedish Institute for the Marine Environment (SIME), Gothenburg, in Sweden. He has held faculty positions in the United States at the University of Maryland, University of New Mexico, University of Washington, and was a visiting scientist at the National Center for Genome Resources (NCGR), Santa Fe, New Mexico. Dr Belgrano is broadly interested in ecological and evolutionary studies that use ecosystem status and trend data, for characterising relationships between diversity patterns and ecosystem functioning, which includes the effect of commercial fisheries, climate change and environmental variability. His research approach is to use the broad concepts of macroecology, food webs theory and evolution to understand the underlying common rules governing ecosystem dynamics and functioning. Most of Dr Belgrano’s current work focuses on functional biodiversity, ecosystem-based management for marine fisheries, ocean health, governance, sustainability and resilience in aquatic systems.